Cancer Care Ontario as a provincial agency has undergone a significant transformation in the last 10 years. This paper documents a predictable crisis of radiotherapy capacity at the turn of the millennium, creating an imperative for transformative change. This transformation occurred included a divestment of existing cancer centers to large local host hospitals while retaining service obligations through a financial, quality and performance contract. The paper documents the simultaneous introduction of quality and access measures and the creation of a continuously evolving improvement panel of metrics which underpin the performance of local centers and population-wide reporting of Cancer Control. The recent successful expansion to include renal services is referenced. The story of Cancer Care Ontario (CCO) is rooted in its early origins as the Ontario Cancer Treatment and Research Foundation (OCTRF, a thumbnail history is sketched briefly in Appendix A). Some of the early evolution and more recent challenges are documented, respectively, by Cowan (2008), Hayter (1998) and Sullivan et al. (2003). The history of relevance begins with the discovery of radium, the appointment of a provincial medical registrar for cancer and the creation of a small number of regional cancer centres co-located on the site of academic health science centres, but housed separately and governed separately from the hospital services on which much ancillary care was dependent. Following the Cody Commission recommendations (1932), OCTRF came into existence through an act of the provincial legislature in 1943, and the statute remains the governing legislation to this day. The policy legacy of this early organization was to create a cancer system with a strong radiation oncology orientation with little attention to surgery and no real structure for the broader arsenal of cancer control. These early arrangements created what political scientists call institutional "lock in," which results in durable institutional designs that are challenging to change (Pierson 2000). While the original institutional designs of OCTRF were suitable to the management and controlled introduction of radium as a source of treatment for cancer, the unintended effect of this design was to create very significant resistance to the evolution of mature, multi-disciplinary approaches to cancer control from prevention to palliation. Starting in the early 90s, there was concern within the agency that the expansion of radiation capacity within Ontario (and many other provinces) was not sufficiently fast or large enough to respond to the epidemiologically inevitable and dramatic rise in cancer cases largely associated with a growing and aging population. The work of the cancer agency at that time began in the late 90s in earnest to deal with multiple crises (inadequate supply of a range of professionals and technical staff, insufficient capital investment in radiation treatment machinery and inadequately short hours of operation). The consequence was inevitable, as clinicians properly decided that patients with several types of cancer were waiting too long for treatment, a re-referral office was established at CCO to expedite referrals between centres with long waits and centres with shorter waits, as well as to offer treatment in neighbouring border cities within the United States. In addition, a privately managed team led by Dr. Tom McGowan established under contract with CCO, an afterhours radiation treatment program at Sunnybrook Hospital to improve the internal re-referral process within Ontario, as many cancer patients were unable or unwilling to travel to the United States for treatment. All centres began running longer hours to deal with the backlog. Compounding the challenges, Princess Margaret Hospital (PMH), the largest and most research-intensive cancer centre in Canada, was not integrated with the family of CCO cancer centres within Ontario. Viewed in retrospect, this crisis was in no small measure tied to the reluctance of successive provincial governments of all stripes to deal with the expensive capacity expansion required in the cancer sector. It was tied also to the apparent inability of the agency leadership to convey, directly and responsibly, to the public, the scale of imminent crisis as a way to motivate appropriate political action to rapidly enlarge capacity. In June of 2001, when I joined CCO as vice president of prevention and cancer control, the front-page headlines in major Ontario newspapers announced that the province had decided to dismantle the cancer agency because of the serious political fallout arising from its inability to care for the population it was intended to serve. Predictable public outcry ensued against such a dismantling, and a committee of wise people was assembled to provide guidance on how to refocus the agency in a more solution-oriented fashion. In late 2001, Alan Hudson was asked to chair the Cancer Services Implementation Committee (CSIC) and gave able leadership to the development of a set of recommendations to improve cancer services within Ontario (Hudson 2001). Shortly after the release of this report, Dr. Hudson was appointed the CEO of the agency, until the fall of 2004 when he stepped out of the CEO role to lead the provincial wait-time strategy as part of a transformation team established by the Premier of Ontario. I was appointed CEO in the fall of 2004. The CSIC report laid out a number of areas for transformation and improvement, and we worked vigorously to refine the redesign details as we moved over the course of two years. These included the divestment of assets and staff to regional hospitals through a complex legal and administrative transfer. The arrangement had elegant simplicity administratively. The agency transferred these assets to the hospitals through a master service agreement that allowed the agency to continue holding the funding levers for the services, and hospitals agreed to certain performance and data delivery obligations as part of the agreement. In a short period of approximately 18 months, the agency moved from a service delivery organization to a fund-holding agency with a strong focus on quality and performance, with purchasing authority for cancer services within Ontario. The story of getting the transfer done was well-told in a short piece by Thompson and Martin (2004) and the overall transformation by Sullivan et al. (2005). We took counsel from Ken Kizer early on his pace-setting experience within the Veterans Health Administration system in the United States as we pushed forward the reform of cancer services in Ontario. Ken Kizer advised we get the right folks on the team to make the transformation, and he also advised us to document and study the transition from the "old" CCO with a narrow focus on radiation and chemotherapy, to the "new" CCO with a broader focus on disease control from prevention to palliation, with a carefully instrumented series of metrics. 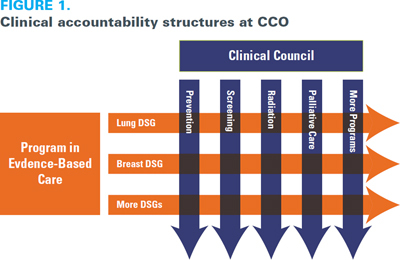 One of the early tasks that the "new" CCO undertook was to establish a Quality Council, which to this day plays a quasi-independent role in capturing and reporting publicly on performance metrics across the spectrum of cancer control, to drive necessary improvements. It also ensures that the public and policymakers have visibility into the real performance of their cancer services with independent input from members of the quality council. To the best of my knowledge, the Cancer System Quality Index was the first jurisdiction-wide reporting on a comprehensive set of clinically vetted cancer system performance and quality measures, informed by an earlier stock-taking of the problems in performance and access (Sullivan et al. 2003; Greenberg et al. 2005). With the realigned accountability and contract agreements in place and an initial picture built on the quality of care and performance, the first provincial three-year cancer control plan in Canada was rolled out in 2005 to address the major capacity problems in the sector and build out a more comprehensive cancer control plan that spanned the spectrum. This plan called for and detailed a very expensive capital program to grow the number of cancer programs in Ontario from 7 to 14, which were aligned to regional boundaries established for local health integration networks in Ontario. This expansion, supported very actively by the provincial government as laid out in the 2005 plan, is more or less complete. It has resulted in a large expansion of roughly 50%, which closes the gap in provincial radiation capacity. Moreover, the technology has been upgraded to intensity-modulated radiation therapy to create more precise targeting of disease in radiation medicine. Following Ken Kizer's advice, the executive structure of CCO was realigned around three important councils and there was a more or less complete turnover in the executive leadership. The councils comprised the Quality Council noted earlier, which assembles and reports publicly on a provincial and regional picture of performance and quality; and a new Clinical Council to ensure engagement of specialty discipline and disease site leaders; a regional Provincial Leadership Council that brings the regional vice presidents together to align overall planning, performance measurement and reporting activities and to ensure continued momentum to link access and quality metrics to executive accountability regionally and provincially. The then chief of operations at Princess Margaret Hospital (Dr. Bob Bell) was selected to chair the Clinical Council, effectively integrating Princess Margaret Hospital with all the other cancer centres in Ontario for the first time. This ensured that all cancer centres in Ontario had full and active participants in the provincial cancer control agency and in population-based cancer control. There has been no looking back. The Clinical Council was and remains a central vehicle to ensure that medical, radiation, and surgical oncology developed improvement plans and targets. As part of the reform, the leadership in the allied oncology disciplines of pathology and laboratory medicine was established, and for the first time, other allied disciplines central to the cancer control agenda were drafted in provincial leadership roles. The pathology team displayed great leadership in early conversion of paper registration of cancer to e-pathology and synoptic reporting consistent with American College of Pathology checklists.These included imaging, nursing, primary care, palliative care, screening and preventive oncology. Between 2005 and now, successive professional leaders have been identified for each of these disciplines. They in turn interact with and have built network relationships with equivalent leads in each of the regions to both align efforts and ensure an overall clinical governance model for cancer within the province of Ontario. Figure 1 illustrates how the clinical council is effectively embedded with the Program in Evidence-Based Care to generate systematic reviews of emerging evidence in specialty care and site-specific disease state management to advance priority improvement initiatives through a Plan-Do-Study-Act cycle, on a quarterly and annual basis. In the past few years, CCO introduced a more articulated clinical governance model to increase accountability for quality within the CCO network and to ensure the advancement of an evolving and dynamic clinical leadership culture with CCO (Duvalko et al. 2009). In addition, the introduction of participation in quality activities as a recognized professional activity in the radiation and medical oncology alternate payment plans was key to committing oncologists to the quality agenda, as was the introduction of quality in the academic surgical oncology alternate payment plans. CCO as an organization has forged ahead with a revitalized model of disease state management for cancer, with reasonably good clinical microsystems for instrumentation of the patient journey and with the elements of a learning healthcare system, and a high-performance delivery organization (Sullivan et al. 2008, Krzyzanowska et al. 2013). CCO has many firsts that it can celebrate, and a longer story is told in an online document (see: Appendix A). Here are just a few highlights. As a consequence of Alan Hudson playing a lead role in the wait-time reduction efforts on the part of Ontario, CCO took on the role of designing and deploying hospital information systems to capture a range of waiting intervals, eventually including emergency room and surgical wait times for key procedures enumerated by the provinces as part of the 2005 First Ministers' accord on improving access to such procedures (Sullivan 2009). The development and expansion of wait-times measures and their implementation in Ontario was a fortuitous opportunity to build on CCO's already well-developed registry and information systems capacity to provide another province-wide service. It also allowed some experimentation with linking wait-time reductions with modest incentives to do a quality job. If quality standards were not met, then payment could be withheld. While this option was rarely exercised, it allowed a range of escalation measures before money was raised and presented a powerful impetus to do a better job. With the wait-times initiative in motion, the newly invigorated surgical oncology program flourished as an aligned provincial leadership with corresponding responsible regional surgical leaders to drive stepwise improvements in quality in a range of areas from thoracic and hepatobiliary-pancreatic procedures to sentinel lymph node biopsy in breast cancer to improvements in colon and rectal surgery, to margins in prostate surgery, to mention just a few. These initiatives (and more are emerging) were developed with strong clinician engagement along the way. While progress was made in the past decade in Ontario on reducing and managing wait times for a number of key surgical and diagnostic procedures with quality improvement along the way, the current absence of a strong and provincially mandated leadership voice on access to care remains a vexatious problem. Our country remains an international outlier on access problems in primary care and in specialty care. We and our governments must push harder to deal with these problems directly and in a timely manner. These access issues have much less to do with supply and much more to do with the organization of and payment methods for our professionals (Lewis and Sullivan, 2013). Not unlike cancer, chronic kidney disease (CKD) in Ontario evolved regionally in an inequitable manner with few quality and performance standards. In 2009, the Ministry approached CCO to see if it might be possible to support the development of a better disease state management program for the rapidly growing number of patients with CKD in Ontario. Not surprisingly perhaps, the patient and clinical community was ready to engage. A strong information platform was built with good clinical leadership, common measures of quality and performance were specified and the entire renal community is now pushing towards stronger performance and quality based on targeted improvements across the range of indicators set by the community and publicly reported by the community (ORN 2013). What Is Next for CCO? 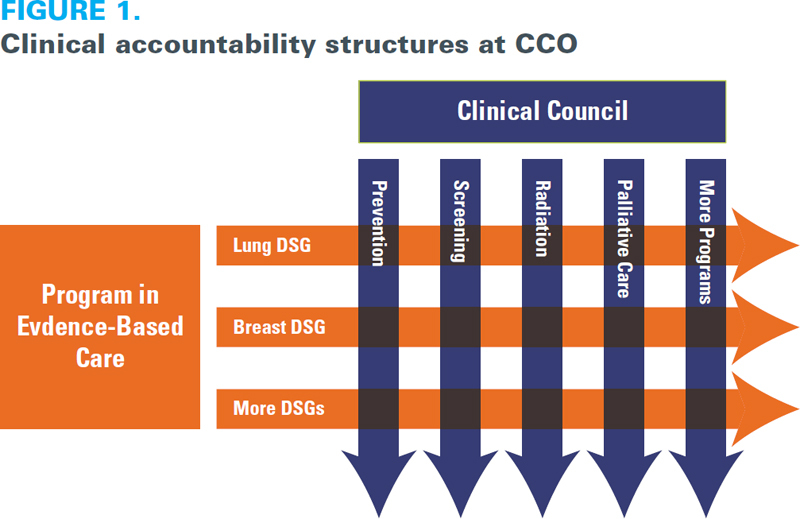 CCO has built a strong and clinically aligned platform for advancing the disease-state management of cancer with strong clinical involvement, good planning and informatics capacity, strong political support and public reporting against explicit goals. The addition of Access to Care and the Ontario Renal Program to the agency marks the evolution into a de facto, multi-service agency. This places the organization in a strong position. The provincial government has further sanctioned this status by entrusting CCO with leadership now on some Quality-Based Payment initiatives to advance quality and sustainability of services in Ontario. These facts ensure its continued vitality and relevance in a world of competing priorities. With these considerations in mind, CCO faces a promising future and will have to struggle with the evolution of a coherent identity and legal mandate as an organization with its feet strongly in the disease-state management arena. It is an organization and a network committed to illustrate the features of a learning health system that can adapt and evolve with changing evidence and changing imperatives for learning and improvement (Olsen et al. 2007). This collection lays out some thoughts on new directions, informed by recent history and the explicit public commitments in planning that have been made by the agency. Ten years after service integration, CCO has moved fast and far from its days of access crisis at the turn of the millennium in Ontario. A new approach to primary prevention focussed on advancing chronic disease prevention is well-outlined in the paper "Primary Prevention – Recent Developments in Policy and Support" by Rabeneck and others (see: www.longwoods.com/content/24003). This approach to enable policies for the reduction of major risk factors for multiple chronic diseases follows naturally on CCO's significant legacy and leadership in supporting the development of a smoke-free Ontario in the past decade. The emergence of an integrated screening effort, built on ColonCancerCheck – the first organized colorectal screening program in Canada, allows the organization to send invites and reminders to men and women to increase screening participation rates and follow-up for breast, cervical and colon cancer screening, including the new addition of a focused screening effort for women with elevated risk for breast cancer. That story is laid out in "Successes and Challenges in Population-Based Cancer Screening" by Rabeneck and colleagues (see: www.longwoods.com/content/24004). As a consequence of building a number of province-wide electronic platforms, CCO is in the position of beginning to build better analytic capacity to "instrument" the patient journey from prevention to palliation within the cancer and renal services it supports. This effort, which offers further promise of greater integration and better evidence-based intelligence to inform both patients and providers, is detailed in "Strategic Analytics: Towards Fully Embedding Evidence in Healthcare Decision-Making" by Garay and others (see: www.longwoods.com/content/24005). The challenges of building a stronger focus on a more integrated, patient-centred approach to care, with a particular focus on prevention to palliative care, are explored in some greater detail in "Integrating Cancer Care Beyond the Hospital and Across the Cancer Pathway: A Patient-Centred Approach" by Evans and others (see: www.longwoods.com/content/24006). A large part of the rational for reforming cancer services in 2004 was to integrate services more closely for patients. While progress has been made within the cancer services community, better integration of primary, home and community care, with the patient at the centre, remains challenging, and palliative care for patients is particularly in need of greater attention. The presence of a primary care network attached to CCO has been a strong foundation on which to advance this objective. CCO has been fortunate enough to host an aboriginal cancer services unit, which has built a strong focus on improving equity. While incidence rates remain slightly lower in the FNIM community in our country, there is a enormous effort required to close the gap in disparities with First Nations, Inuit and Metis (FNIM) people and the rest of Ontario, as cancer incidence and numerous chronic disease rates are rising and life expectancy is poorer among FNIM people. The paper "Improving Health Equity for First Nations, Inuit and Métis People: Ontario's Aboriginal Cancer Strategy II" by Kewayosh (see: www.longwoods.com/content/24007) and others lays out the elements of a new Aboriginal cancer strategy. The major challenges and the need to develop adaptive policies and strategies for personalized medicine are tackled by Pollett and others in "Personalized Medicine: CCO's Vision, Accomplishments and Future Plans" (see: www.longwoods.com/content/24008). The genomic revolution arrived first in cancer, and the manner in which we shape the policies for quality standards in test, the evaluation and payment for companion diagnostics and the challenges of the cost of new cancer agents will set the pace for other areas of medical care. Woodward and others detail nicely in "Implementation of an Agency to Improve Chronic Kidney Disease Care in Ontario: Lessons Learned by the Ontario Renal Network" (see: www.longwoods.com/content/24009) the early phase of the Ontario Renal Network (ORN), a brand new entity service for patients with CKD within the CCO corporate umbrella. This new enterprise has benefitted from good clinical and administrative leadership and the refinement of existing information systems. In three short years, the ORN has begun to make important differences in the quality of care, the distribution of different modalities of care for patients with CKD and providing public reporting on progress. Adalsteinn Brown, who gave vigorous early and ongoing counsel in the development of strategic indicators for CCO, has laid out nicely in "The Challenge of Quality Improvement at the System Level. Whither CCO?" (see: www.longwoods.com/content/24010) the key organizational processes and policy elements that have allowed CCO to make progress, and how the features of performance and quality measurement, clear goals and engaged clinical leadership, with good data support, can lead to significant gains in service quality. Last and importantly, Michael Sherar and team took on the task of where to from here for CCO (see: www.longwoods.com/content/24011). While much has been accomplished, important challenges remain going forward, to ensure a vibrant and innovative future for an adaptive organization working to model a learning healthcare system. Terrence Sullivan is Professor and Senior Fellow, Institute for Health Policy Management & Evaluation, University of Toronto. He is also Adjunct Professor, Department of Oncology, McGill University. Cowan, D. 2004. "Connecting the Circles: A History of the Governance of Cancer Care Ontario." Retrieved December 4, 2014. <cancercare.on.ca/search/default.aspx?q=Don%20Cowan&type=0,6-76,6-40484|-1,1377-78>. Duvalko, K., M. Sherar and C. Sawka. 2009. "Creating a System for Performance Improvement in Cancer Care: Cancer Care Ontario's Clinical Governance Framework." Cancer Control 61(4): 293–302. Greenberg, A., H. Angus, T. Sullivan and A. Brown. 2005. "Development of a Set of Strategy-Based System-Level Cancer Care Performance Indicators in Ontario, Canada." International Journal for Quality in Health Care 17: 107–14. Hayter, C. 1998. "Historical Origins of Current Problems of Cancer Control in Canada." Canadian Medical Association Journal 158(13): 1735–40. Hudson, A. 2001. Report of the Cancer Services Implementation Committee. Retrieved December 4, 2014. <http://www.health.gov.on.ca/en/common/ministry/publications/reports/hudson/hudson.pdf>. Krzyzanowska, M., D. Blayney, L. Bosserman and T. Sullivan. 2013. "Models that Work: Incorporating Quality Principles in Different Clinical Settings." Journal of Oncology Practice 9(3): 135–37. Lewis, S. and T. Sullivan. 2013. "Deal with Doctors." Policy Options, June, 24(5):29-32. Olsen, K., Aisner, D. and McGinnis, J., eds. (2007) The Learning Healthcare System Institute of Medicine (US) Roundtable on Evidence-Based Medicine. Washington, DC: National Academies Press. Ontario Renal Network, 2013. "Ontario Renal Reporting System. Retrieved December 4, 2014. <http://www.renalnetwork.on.ca/cms/one.aspx?portalId=256223&pageId=262917#.VICYjcmfbVQ >. Pierson, P. 2000. "The Limits of Design: Explaining Institutional Origins and Change." Governance: An International Journal of Policy and Administration 13(4): 475–99. Sullivan, T. 2009. "Waiting for the Referee or Referring the Wait? CCO's Role in Hosting and Deploying the Wait Time Information System in Ontario." Healthcare Quarterly 12(Special Issue): 20–21. Sullivan, T., W. Evans, H. Angus and A. Hudson, eds. 2003. Strengthening the Quality of Cancer Services in Ontario. Ottawa: Canadian Healthcare Association Press. Sullivan, T., M.J. Dobrow, E. Schneider, L. Newcomer, M. Richards, L. Wilkinson et al. 2008. Améliorer la responsabilité cliniques et performance en cancérologie [Improving Clinical Accountability and Performance in the Cancer Field]. Pratiques et Organisation des Soins [Practices and Organization of Care] 39(3): 207–15. Sullivan, T., L. Thompson and H. Angus. 2005. "Transforming Cancer Service in Ontario: A Work in Progress." Healthcare Papers 5: 43–51. Thompson, L. and M. Martin. 2004. "The Integration of Cancer Services in Ontario: The Story of Getting it Done." Hospital Quarterly 7(3): 42–48.